Di o Bispo de Alcalá que estou a caer en anacos, estoume a desintegrar, ou mais a desconstruír , coma eses pratos da cociña moderna que tanto están de moda. Este representante da curia romana xa xerou polémica cando atacou e insultou aos homosexuais tratándoos coma enfermos, abre agora a boca para insultar ás mulleres, moléstanlle os dereitos civís dun Estado declarado na Constitución como aconfesional... as mulleres, que coa nova lei do aborto imos ser privadas do dereito a decidir sobre a nosa propia vida, o noso propio corpo...unha involución en dereitos de mais de 30 anos; agora (e sempre) ao Bispo de Alcalá moléstanlle as mulleres que pensan. Bishop of Alcalá de Henares (Madrid) says that I’m falling apart, that I'm disintegrating myself, or even that I’m deconstructing myself, like these courses of modern cuisine that are so fashionable right now. 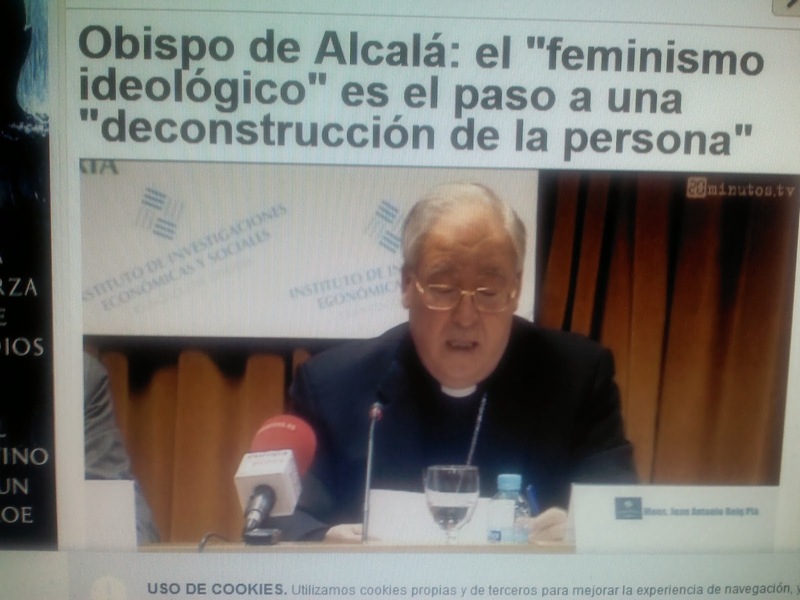 This representative of papal Curia already caused a controvesy when he attacked and insulted homosexuals considering them as ill, now opens his mouth to insult women, the civil rights of a State declared in the Constitution as nondenominational annoy him ... women, who with the new “anti”-abortion law are going to be deprived of the right to decide over our own lives, or our own bodies ... a regression of rights of more than 30 years; now(as always) women who think annoy the Bishop of Alcalá. 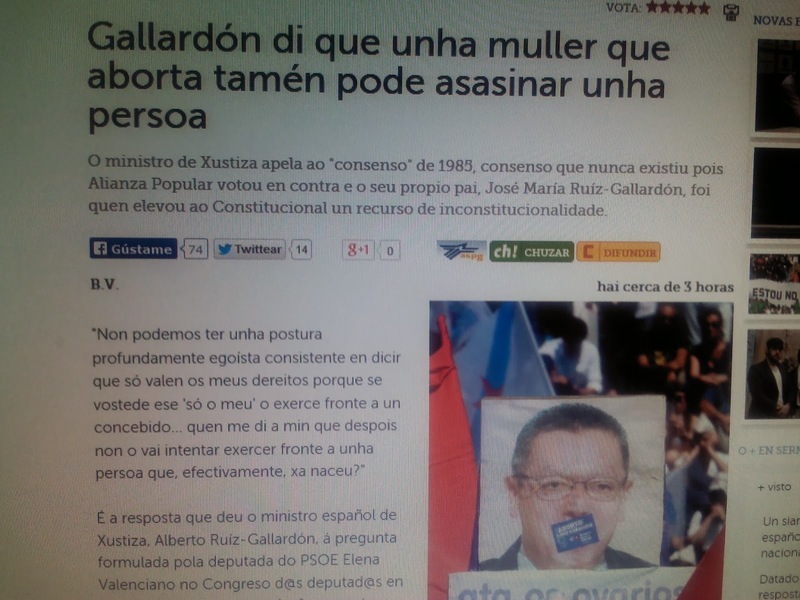 Gallardón: "A woman who aborts is also capable of killing a person"
Sempre pensei que para rectificar os abusos e excesos do machismo había que reeducar tanto a homes coma a mulleres, mais nestes días recoñezo que teño que controlar a miña ira para non perder as formas. É o que queren, que rebentemos mentres eles nos falan con eses tons de voz dos que non matan moscas mais reprimen na escuridade con premeditación e aleivosía. 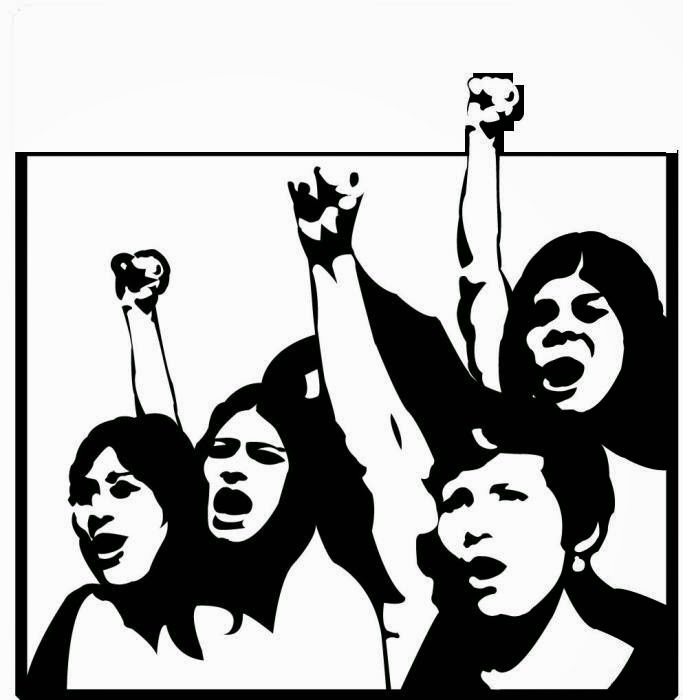 I have always thought that we have to re-educate both women and men to rectify the abuses and excesses of chauvinism, but I have to say that these days it’s difficult for me to control my rage and not forget my manners. This is that they want, that we rage while they talk in those kind of tones that never kill a fly but torture it in the darkness with premeditation and treachery. Si, son meiga e son perigosa, cun poder ilimitado coma case todas as mulleres galegas. Consciente da miña natureza estou segura que fun queimada nalgunha (ou moitas) vidas pasadas e agora hai quen pretende repetir a xogada nesta presente; non me importa, o lume purifica, e por moita ameaza que escoite non vou deixar de ser o que son: unha muller galega vivindo en harmonía coa miña natureza e con poder sobre meu propio corpo xa ninguén ten dereito violentar a miña vontade. 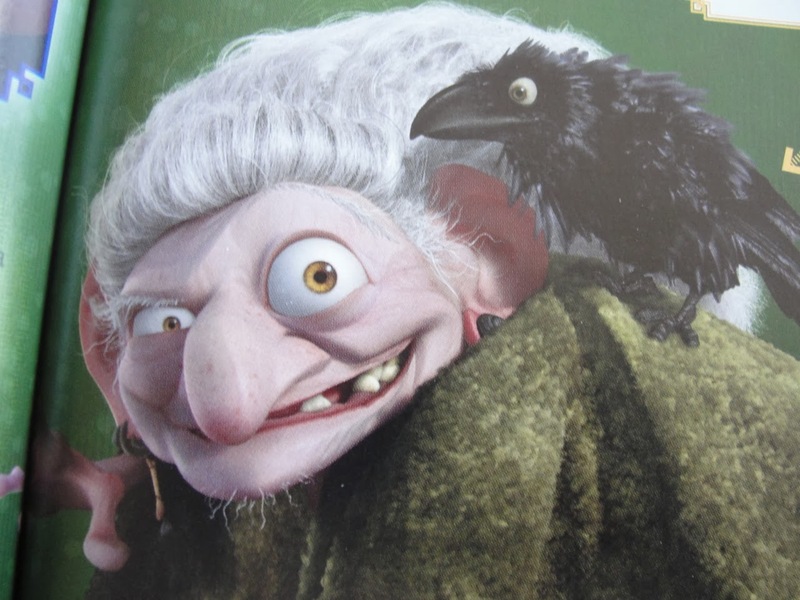 Aye, I’m a witch and I’m dangerous, with an unlimited power like almost all Galician women. 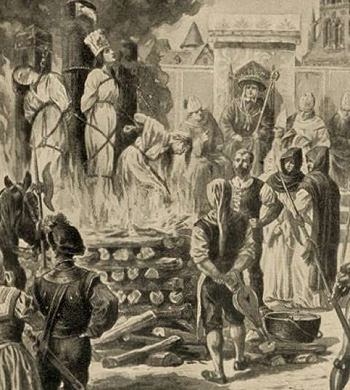 I’m conscious of my own nature and quite sure that in one or some past lives I was killed by burning, and now there are those who would try to repeat the same scenario in the present day. 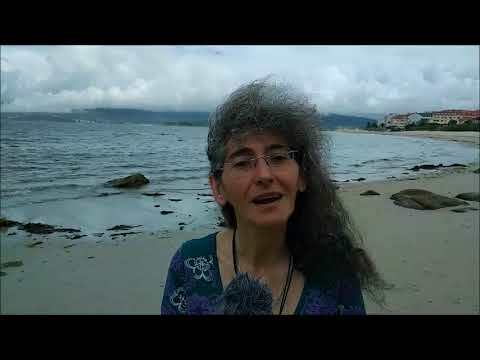 I don’t mind, fire purifies, and for all the threats I hear I won’t stop being like I am: a Galician woman living in harmony with my own nature and with power over my body because NOBODY, has the right to violate my will. Porque, señor Bispo, a miña ideoloxía (coma vostede di) , esa que lle molesta tanto e que tenta anular e liquidar obsesivamente, é mais san, respectuosa e construtiva que a súa, e non renuncio nin renunciarei a ela xamais. Por moitos esforzos que fagan para minimizarme e reprimirme coma muller non o van conseguir, no meu corpo e na miña mente mando eu. Because Mr. Bishop, my ideology (as you have called it), this ideology that bothers you so much and that you are obsessively trying to override and liquidate is healthier, more constructive and more respectful that yours and I’m not giving it up, I will never give it up. You can do anything you like to try and minimize or repress me as a woman, but you won’t manage, I am in charge of my body and my mind. Vostedes, fanáticos, que en séculos pasados xa temiades ás mulleres por seren demoníacas capaces de sangrar cada mes sen morrer ou por teren o don de adiantarse aos acontecementos (non como Rajoy), vostedes talibáns, sodes os que estades descontruíndo a sociedade cos vosos repetidos (ad nauseam) esquemas de Torquemada e nos insultades e castigades co voso discurso anacrónico, nun alarde de nostalxia dos tempos mais escuros. You, fanatics, that in past centuries did fear women for being demons able to bleed every month without death, or because we have the ability to foresee events (unlike Rajoy), you talibans, who are deconstructing society with your all Torquemada schemes repeated (ad nauseam) and who are insulting us and punishing us with your anachronistic speech, in a display of nostalgia for the very darkest times. Eu non vou renunciar a min mesma. E tampouco vou renunciar a vós agora, xa o fixen hai moitos anos apostatando das vosas aberracións. I won’t renounce myself. Neither will I renounce any of you now, I already did many years ago with my apostasy of your aberrations. P.D. Sempre respetei, respeto e respetarei calqueira relixión namentres non intenten impoñerme algunha das súas normas e fundamentos. P.S. I have always respected, I always respect and I will always respect any religion while it doesn't try to impose its rules and fundamental on me.